I've seen these around the web a lot, specially on "survival" boards on Pinterest; so I thought I would give it a try. 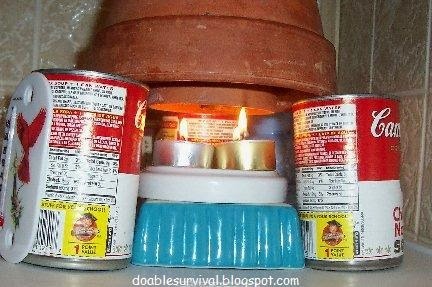 They are supposed to enhance the heat of a candle/candles in a small room in an emergency or to save money. I wasn't impressed at all. Very disappointed actually. I've tried it several ways now. The first time, I didn't have as many washers and nuts. I tried it again today, improving it, and got the same results. I think there are better options like the emergency alcohol heater I did a blog on. (click here) I tried it in my tiny bathroom, just 4 feet x 8 feet, and closed the door for an hour. I had a thermometer right next to it, and it didn't even budge. If it did, it wasn't enough that I could even tell. It felt good to hold my cold hands on the outside pot, but that was about it. The parts I used this time. 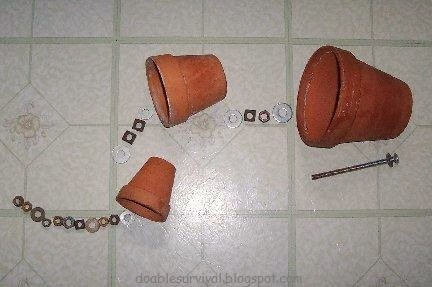 You simply put a bolt through the holes in the bottom of 3 Terra-Cotta pots. 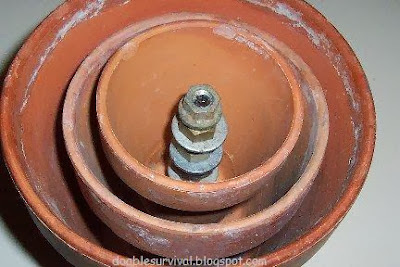 First, put a washer on the bolt so it closes off the hole of the large pot. 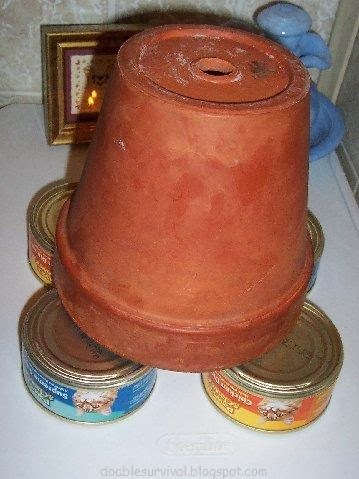 Put the large pot on. Then, put on a washer, two nuts, and then another washer. Then put the next pot on and repeat until you have 3 pots together. Then, I filled up the rest of the bolt with washers and nuts like the Kandleheeter advertisement shows. (click here) You want to fashion a stand or prop it on something around the candle. 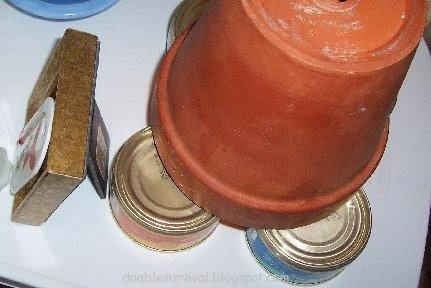 I used soup cans. 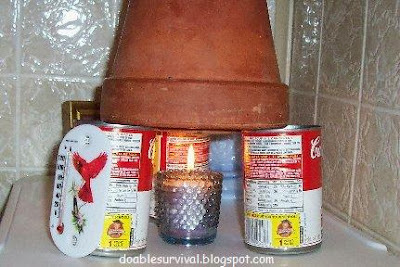 I tried it like this and then with the candle up higher. 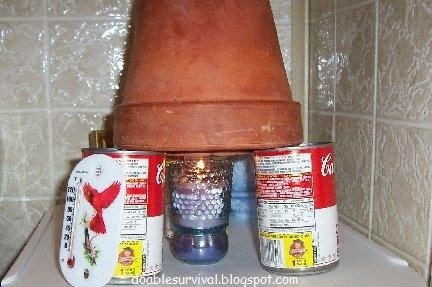 As you can see, I used soup cans to prop the pots on. Note the thermometer on the left. I also tried it with the candle up as high as I could put it. 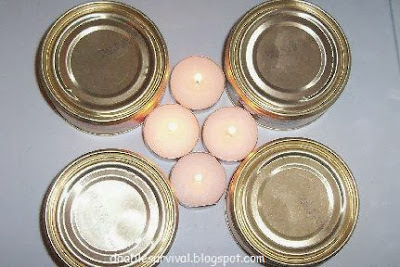 I even tried 4 Tealights, same as using 4 candles, same results, nuttin'! 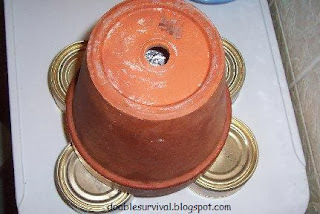 I also tried this 2-pot version (photos below) that I saw a video clip on. (click here) Again, I put it in my tiny 4 x 8 foot bathroom and closed the door for an hour with a thermometer right next to it. It seemed to go up one degree. Not much huh? (Note, I wouldn't suggest using something like this to heat a small room on a regular basis like the guy in the video. Most candles have carcinogens, so you shouldn't use them too much. You would want to get soy candles, so I hear.) My interest in these was for emergency situations. long as the pots aren't down too close around the candles. If they don't get enough oxygen, they go out. blocking the hole in the bottom. 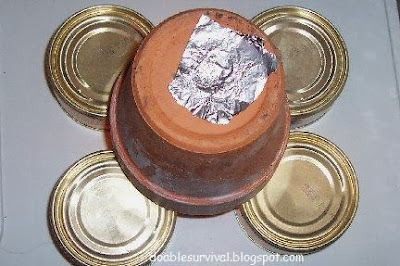 Put a larger pot over that one (this pot is 6 inches), leaving the hole open. Thank you for reading my blog! Leave a comment below if you would like. You don't have to sign in. Crud, I was really hoping this was going to pan out. Thinking just in how much it costs to get this thing going and keep it warm, I guess that was the indication of what you're going to get. I think you need two larger candles and not so much height. 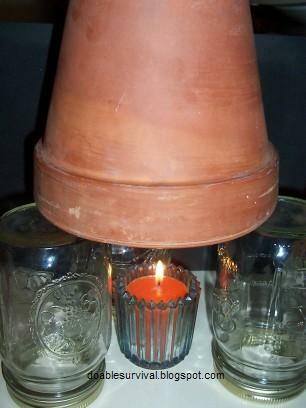 From the photo, that one little candle could not have heated the pottery sufficiently. I was trying the set-up that is making the rounds on Pinterest. You can actually buy them. I tried it lower than in the photo too. I was skeptical that it would work. I have more washers and nuts, so I suppose I should try it again. I made a new-improved version and still nuttin'! 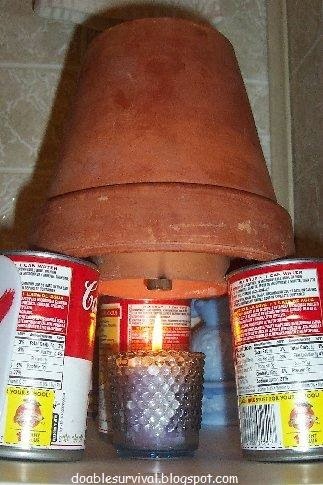 I tried a 2-pot version and that improved the temperature by one degree (in a 4 x 8 room for one hour). Still not worth the trouble. :( I did the updates above. BTW, the size of the candle doesn't matter. Even the Tealight wicks are the same size as a regular candle. They just don't burn as long because they don't have as much wax. The size of your conductor (the metal hardware) is your problem. yeah, you cant make a candle put our more heat (energy) that it already does this comes from the basic fundamentals in that you cannot create energy.